Home News Weather Why Does it Rain so Much in the Netherlands?! Why Does it Rain so Much in the Netherlands? If you have ever visited, or lived (or still live) in the Netherlands, then you know that the weather can be a bit hit and miss. Whether it’s raining, windy, stormy, freezing, snowing, or raining again; there always seems to be something to complain about. Some people say that it rains so much here because the House of Orange arranged it with the Powers That Be so that Dutch people have something to talk about! But why does it rain so much in the Netherlands? And does it actually rain that much more than other places? Let’s find out! As you probably know, the Netherlands is located next to the North Sea, and the wind direction usually blows southwest, which means it has what’s known as a ‘moderate maritime climate’. This means that Holland experiences warm (but not hot) summers and fairly mild winters, without any really big temperature changes during the seasons (which is certainly not how it feels to me during winter!). But compared to places such as say, Canada, the Netherlands doesn’t actually get that cold; as evidenced by the excitement this past winter around it being cold enough to freeze the Amsterdam canals properly for the first time in about seven years. When all else fails, the Dutch just ice-skate on the roads! While it seems like it rains A LOT in the Netherlands, in actuality, the average rainfall isn’t that high. The main reason that it sure seems to rain so much is because the weather can be very unpredictable and the lack of mountains in the Netherlands means there is nothing to block any incoming depressions from the sea. The Netherlands actually only receives about 700 millimetres of rainfall a year, which is fairly similar to places such as San Antonio, Texas (just without any of the really extreme temperature changes, floods and tornadoes)! I’m personally very thankful that the Netherlands doesn’t get weather like this! But while I can tell you that it doesn’t actually rain that much here, it doesn’t change the fact that the unpredictability of the weather can still be annoying. So even if the weather seems nice and sunny in the morning, by the afternoon it might be raining; so you always need to take an umbrella or jacket just in case. And when you go out during the middle of Summer, expecting a lovely warm sunny day, but instead you get RAIN (again!) it sure does feel like it’s always raining! How to Survive the Weather in the Netherlands! While it might not rain a huge amount, the rainfall does come fairly often in small parts. And even those small parts can be annoying when you are trying to get to work or school, sight-see or travel around the country. Our top tips for surviving the Dutch rain? Always carry a decent umbrella with you – preferably one small enough to fit in a bag but strong enough not to turn inside out as soon as it’s windy; which it also usually is here in the Netherlands! If you’re getting into the Dutch habit of biking everywhere, make sure you cover your bike seat with a plastic bag (held on with a rubber band) when you’re leaving it outside – this will save you having a wet behind when you have to get back on it after a rain-shower! Check the weather apps, but don’t always trust them. Sometimes mine has told me it’s snowing when it’s sunny, so at least look outside as well. If it is raining (or pouring) take advantage of some the country’s great indoor attractions: such as museums, art galleries and breweries. 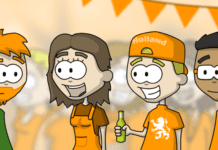 And, for more tips on surviving the Dutch weather, and to learn some new Dutch words about rain, make sure you watch this amusing video by the Survival Guide to the Dutch! Hey, did you know we are on Pinterest? Check out our profile here or pin this for later!